To paraphrase George Orwell, the people who vote for corrupt and useless leaders are not victims but accomplices. Octavia Butler reminds us to use wisdom and not excitement or ukwalola umwela when choosing leaders because the decision we make on the ballot has far reaching consequences in our lives. When you elect a coward you are controlled by all that the coward fears; when you elect a fool you allow the opportunists, bakandile, bamukukulu to manipulate the fool and take control of him and the state power he yields. The sycophants takes over and start controlling the leader; to be led by a thief is to dip your hard earned taxpayers’ money into the pockets of a few connected and corrupt thieves at the expense of the majority poor; when you allow yourselves to be under the yoke of tyranny you surrender your very fundamental basic rights and become slaves to the moronic boma ni boma syndrome. The election of the Mayor of Lusaka was not a simple election because for one to win as Mayor of the greater city of Lusaka he needed to convince voters in Munali, Kabwata, Chawama, Mandevu, Kanyama, Matero and Lusaka Central Constituencies. And of all the people that ran for the position of Mayor of Lusaka, the voters of the greater city of Lusaka decided that Mr Wilson Kalumba was the best of them all. Mr Kalumba was not even a well known fellow before his victory, in fact the man did not even run any aggressive or cordinated campaign but somehow the voters did not care whether they knew the man or not or whether the man had the right vision or ability to lead, all that mattered to them was the fact that the man stood on the Dununa Reverse ticket and that is all he needed to win the election as Mayor of Lusaka. 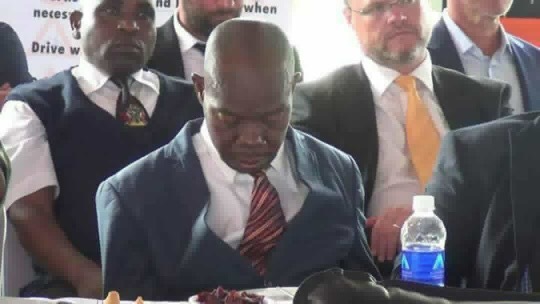 So to start condemning the man for sleeping or indeed for his ineffectiveness and incompetence is laughable indeed because the man did not impose himself as Mayor, he was voted by willing voters who woke up as early as 04 to queue up to choose Mr Wilson Kalumba as Mayor of the greater City of Lusaka. No one forced anyone to vote for Mr Kalumba. If people in the villages, folks in the rural constituencies can properly scrutinise their leaders and elect independent candidates to office why should you in the urban areas choose to vote for a song? So to me, I congratulate His Worship the Mayor, Mr Wilson Kalumba for scooping the seat without even aggressively campaigning for it. In fact he should continue sleeping and snoring for as long as he wants. He is the people’s choice. Mulale mu chibote ba tata, mwabombeni.